The process of structural steel design, fabrication, and erection can be very complex for any modern structure. Many components all need to work with precision toward the greater goal of creating a uniform, solid structure. One concept that originated from the Greeks is framing with columns and beams to create a backbone, or sound support system, for the other elements of the building. If you are on this post looking through the top structural steel fabricators across Michigan, Sanilac Steel is here and ready to help. Since 1967, our steel structure design, fabrication, and erection company has worked hard to deliver the safest and most cost-effective outcomes across the state. We are here to get the job done right, with honesty and precision through every step of the process. Our team is here to enhance our community through comprehensive steel services and education. 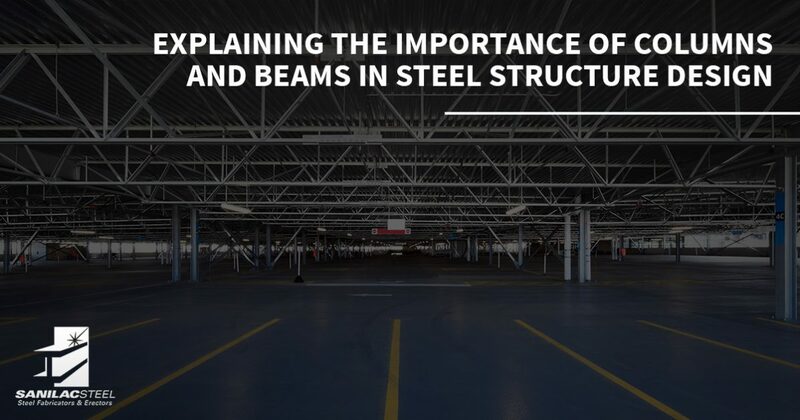 Today, we’ll overview what role columns and beams play in your steel-frame building. Sanilac Steel is proud your source for timely results that meet your expectations. Be sure to call us today for assistance if you are in need of a steel fabrication company! A braced frame, consisting of smaller components to create a network of support. This design scheme relies on simple connections to enhance the dispersal of load stress throughout the structure. This framing option is more cost-effective overall but can fail to deliver with longevity. A continuous frame, not being braced, relies on more durable connections to meet design specifications. This structural steel approach utilizes bolts and welds to minimize the size beam size required for support, giving builders more advantages over bracing techniques. Continuous steel frames are rigid and durable, allowing you to create daring aesthetic designs without the need for additional support elements. It’s important to consider budget restraints when determining your building plan. Keep in mind that continuous framing elements are often more advantageous and costly. In many cases, you can combine these two designs with other support options for an ideal balance. Columns and beams work in tandem to create a uniform frame that helps to resist damages, shearing, tearing, and other problems present during failures. When properly designed, fabricated, and erected, your building will be able to hold an incredible amount of weight. Modern design specifications, combined with the incredible advantages of steel, are engineered to far exceed your expected weight demands. As always, though, time and budget constraints can affect your original designs. If you are needing to complete your steel structure project with a tight budget, Sanilac Steel is here and ready to help. Our team can work with you to find the most cost-effective solutions! Your building will need to meet numerous design requirements to ensure uniform safety throughout the entire structure. Beyond the total weight of your building (including inhabitants, which can add up to over 2,000,000 pounds in structures such as the Empire State Building! ), exterior elements and extremes need to be accounted for to resist dynamic failures. Steel structure design has been shown to resist wind, fire, earth tremors, and more. Keep in mind that much of the strength of your building will rely on its connections. These points have the highest potential for failure and must pass all design requirements to ensure safe results. Check back next time, when our blog post delves deeper into the value of connections in steel fabrication and erection! Your steel beams can provide incredible strengths and highly resistant outcomes for your steel-framed structure, and it can do this with less weight. Many people think of steel being heavier than wood — and it is heavier by volume. However, steel beams are much more efficient by volume, allowing designers to implement lighter frames for added ease and versatility. By reducing your design demands, you may be able to enhance another aspect of your project, saving money, time, and labor in the process. Column and beam steel frames are designed to deliver amazing results for a variety of environments, needs, and budgets. If you are here in need of a team of qualified structural steel fabricators in Michigan, be sure to contact us today for more information and a project quote!